As part of California's Global Warming Solutions Act of 2006, aka AB 32, the Renewable Portfolio Standard (RPS) requires California to install sufficient renewable energy plants to provide 20 percent of all electricity sold in the state, and that is to be accomplished by 12/31/2010, only seven short months from now. This is supposed to reduce CO2 emissions into the Earth's atmosphere, and thereby stop global warming. More on that a bit later. 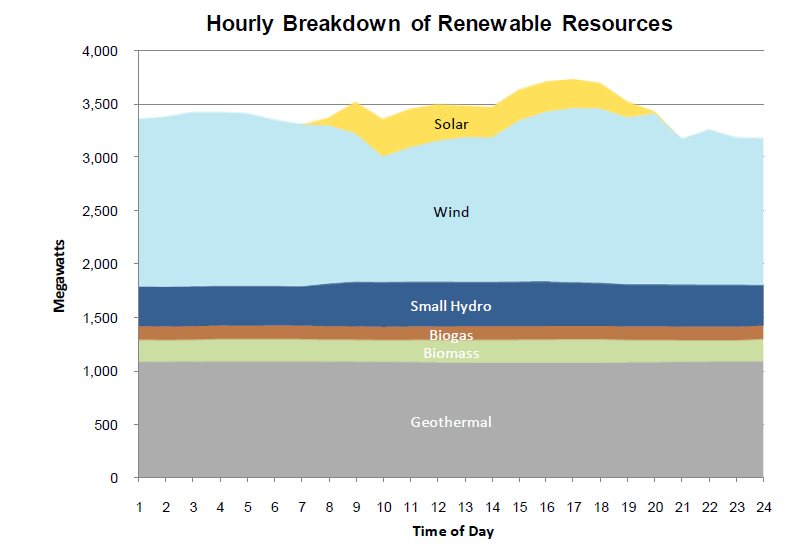 California finally has some data and graphics available (see below) to show the state's production of renewable energy. These are from http://caiso.com/outlook/SystemStatus.html. The first figure below (Figure 1) shows the amount of power (MW or mega-Watts) produced each hour for May 21, 2010. The figure is updated daily. Several important points are apparent from examination of this figure. First, the total MW from renewables is an average of around 3,000 MW. That is approximately 14 percent of the power sold in the state on that day. But, that was an excellent day for wind compared to many other days. Typically, the figure is about 10 to 11 percent of the total power sold. With the 20 percent deadline only 7 months away, it is not likely the state will reach the goal. 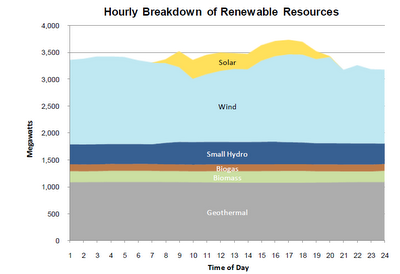 Second, California counts several types of power production as "renewable." The colored bands at the bottom of Figure 1 show relatively constant production from geothermal, biomass, biogas, and small hydro power. These four combine for approximately 1800 MW. The other two, solar and wind, are much more variable in their output. Solar, as is well-known, only provides power for a fraction of the day, slowly ramping up as the sun rises, and ramping down just before sunset. 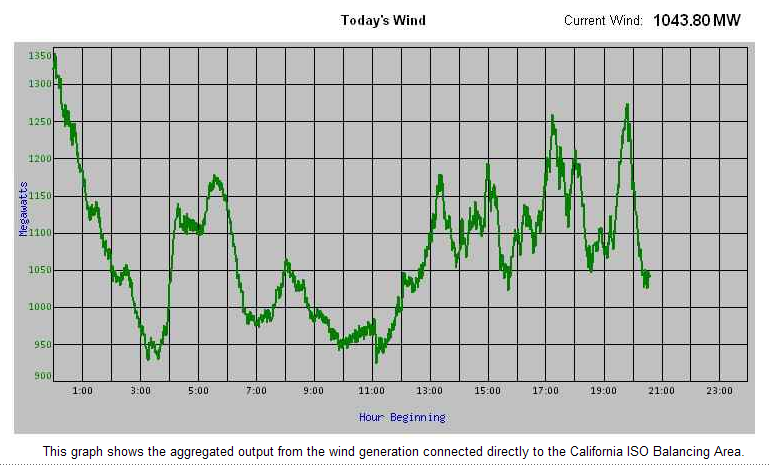 Figure 2, below, shows the power from wind generation in California for today's date, 5/22/2010 through approximately 8:30 p.m. This is an unusually windy day, with a strong wind offshore Southern California, which added to the wind generation. (wind speed at LAX, Los Angeles International Airport today, hourly starting at 3 p.m. was 15, 16, 20, 20, 21, 16, and 21 miles per hour). The statewide variation in wind output from hour to hour is readily apparent from Figure 2, as the green line "goes up" and then "goes down." The other interesting point from both charts is that wind installations in California are not expected to grow much, if any. The three areas with good wind are known, and nearly built out. Solar installations are expected to grow in the next few years, however. The increased production from solar plants will increase renewable production only during the daylight hours, and will require back-up power from natural-gas fired plants. The price of electricity must go up to pay for both types of plants: wind and solar renewables that are highly variable, plus natural gas-fired plants as back-up when the wind does not blow or the sun does not shine. California is unlike other states, and other countries, in that there are large amounts of geothermal power available. There are also vast areas for solar power installations. Neither of these are true for many other states and countries. Also, there is not much ice or snow to foul the wind turbines in California, another big factor in other areas. It is therefore not very likely that any other states, or countries, will follow California's lead in these matters. The higher price of electricity in California may be attributed to the high renewable content of the power sold, at least in part. Another factor leading to higher power prices is the low consumption per capita with a large population. California presently has approximately 36 million people. The cost per kWh must increase when per capita usage is low, in order to have sufficient funds to pay for the infrastructure for transmission and distribution to all those customers. As the climate refuses to warm as the IPCC insists that it will from man's emissions of CO2, and the world-wide recession refusing to end, plus unemployment remaining at historic highs, it will be interesting to see which states, or countries, are dumb enough to follow California's lead in renewable power requirements. Isn't the highest demand for electricity at the same time of day when solar is most effective? And isn't the greatest drag on the system caused by A/C? So if there is less sun, and less electricity produced by PVC, wouldn't there be less demand anyway because the sun is not out? I cannot speak to wind other than I know that substantial projects are slated for the Mexicali area, Sempra being the largest. The energy produced will likely fuel a bidding war for power between CA and Baja. Also, the renewable energy percentage could increase if overall energy use decreases, regardless of whether more infrastructure is created. Smart grid technologies have a huge potential to reduce consumption as well as simple technologies like automated lighting. Smart A/C units or other energy management systems can regulate temperature setting throughout the day so that homes are not heated or cooled too much while inhabitants are at work. My office building just put in motion sensors. I can tell you that alone likely saves 10-20% of overall daily lighting use as many offices lights that used to be on when people were out of the office are now off. If I step out to lunch for an hour (or two), I would never shut off my light. That can be 10-25% of my work day that is now lights out under the new sensor. Simple steps like these, including software that effectivley manages monitor's and PC's seem to me like they can make a huge difference if implemented large scale. My main concern how the hell are we to provide energy and water for the increasing population, regardless of global warming issues. The population of CA is expected to double by 2040. It seems to me that integrating energy and resource conservation and alternatives into the infrastructure, as well as people's daily habits can only help this situation, however small of an effect it may ultimately have. In general, that is correct. The additional load on hot days is certainly caused by air conditioning. That is not always the case, as there are very hot days where A/C demand is high, but the sun is hidden by clouds. 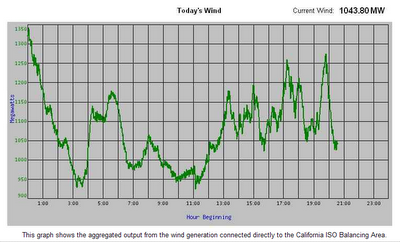 Wind has major intermittency issues, but has the advantage in California of producing power almost 24 hours per day. (Also, the renewable energy percentage could increase if overall energy use decreases, regardless of whether more infrastructure is created.) No doubt this is true, but energy use is not likely to decrease. (Smart grid technologies have a huge potential to reduce consumption as well as simple technologies like automated lighting.) I wouldn't put too much stock in smart grid technologies. (Smart A/C units or other energy management systems can regulate temperature setting throughout the day so that homes are not heated or cooled too much while inhabitants are at work.) We have had time-based thermostats for decades that do exactly that. Nothing new here. (My office building just put in motion sensors. I can tell you that alone likely saves 10-20% of overall daily lighting use as many offices lights that used to be on when people were out of the office are now off.) Motion sensors may actually increase energy use, especially with fluorescent lighting turning off and on several times each day. (If I step out to lunch for an hour (or two), I would never shut off my light. That can be 10-25% of my work day that is now lights out under the new sensor.) See above. (Simple steps like these, including software that effectivley manages monitor's and PC's seem to me like they can make a huge difference if implemented large scale.) ARB would like everyone to agree with you - but the reality is that turning off PC monitors can already be done (as I do) with operating system commands. What can make a big difference in electric demand is better insulation and weather-sealing buildings and other structures. But that is considered too "old-school" and not as cool as smart-grid devices. We have more than abundant energy resources, even for California, with natural gas. All we need is the political will to build the plants. That does occur these days, following the disastrous policies of the last couple of decades. (It seems to me that integrating energy and resource conservation and alternatives into the infrastructure, as well as people's daily habits can only help this situation, however small of an effect it may ultimately have.) The production side is not a problem, where the problems lie are in grid instability caused by huge fluctuations in solar and wind input to the grid, and the higher price of electricity to pay for redundant power plants. Those problems become extreme as the percentage of power from intermittent renewables increases. What is truly needed is a cost-effective way to store solar and wind-generated power, and release it on demand into the grid. The only way to do that cost-effectively is with pumped storage hydroelectric, which we already do where we can. Unfortunately, there are far too few locations where that can be done. The Japanese pump seawater up into elevated specialized lakes in mountains close to shore, but I cannot ever foresee California allowing that. Environmentalists would rather die than allow that. I just took a look at my SCE bill and realized I am paying 24 cts per kwh for Tier 3 service, which is where I end up for using the air conditioning on a hot day. Looks like we will have several more of them this month. If I go Tier 4 or 5its 27 and 31 cts/kwh respectively. This is considerably more than the 12cts and 15 cts/kwh for the lower Tier rates which reflect conventional generation. I can only believe this delta is because we are subsidizing nearly 20% wind and solar at the levelized equivalent of over 50 cts/kwh. The math works out this way. This is a bigger ripoff than Gray Davis's power contracts nine years ago. Are there any potential class action lawsuits being filed against the PUC or the power companies ?